In the castle, the visitors meet people come back from this time. They welcome and guide them in their discovery of this extraordinary house that shows some precious decorations dated back to the 16th century (entrance hall, wooden ceilings, painted room, facade). Princess dresses and knight cloaks are waiting the children for the visit of the castle! In the kitchen, the ancient stoves are ready to simmer the traditional home-made jams, made with pears, rhubarb and plums from the kitchen garden. But the show doesn’t stop at the smell, you can also taste the jams on a crepe and, why not, bring back home some jars! In the park, don’t miss the kitchen garden, exceptionally open on these two days. Here grows old species of vegetables and fruits, especially pears and apple. 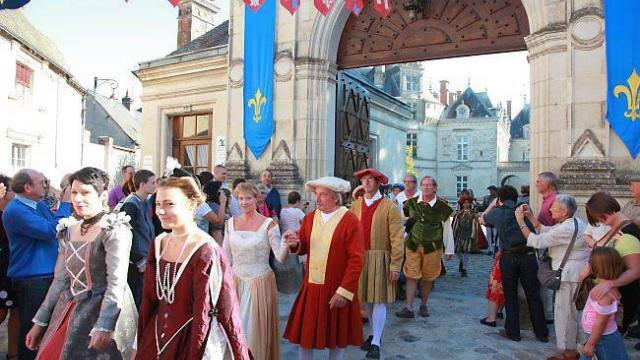 On Sunday morning at 10.30 the great parade starts at the château, with Renaissance costumes.
. buggies are not allowed inside the house.
. on leached dogs are allowed in the park.